If you are looking to brighten up your home decoration and don’t know what to buy, a levitating lamp may be just the focal point you need. The Flyte levitating lamp is probably one of the best levitating light bulb products on the market. It might be better described as a floating or levitating light bulb because that is exactly what it is. We were struck by the design of the product, originating from Sweden and with design as a core element as you would expect. The levitating light bulb effect is achieved by the electromagnets which hold the light bulb in place. These magnets interact with other magnets inside the floating lamp housing, thus holding the lamp in place. That is only one amazing feature of this lamp though. The lamp not only floats but also lights apparently magically while floating. There are no wires or other connections to the floating light bulb which leaves one wondering how the light – lights up. An inquiring mind will be further challenged when the light is turned off simply by touching the base. The floating light is powered by induction – so that is how that works. Nonetheless amazing, and beautifully designed to up your style points for home decoration and choice of furnishings. If you are not into a levitating light bulb or a levitating lamp how about a minimalist one from the same company. Another great design that provides light more conventionally but still looks awesome to be clear. 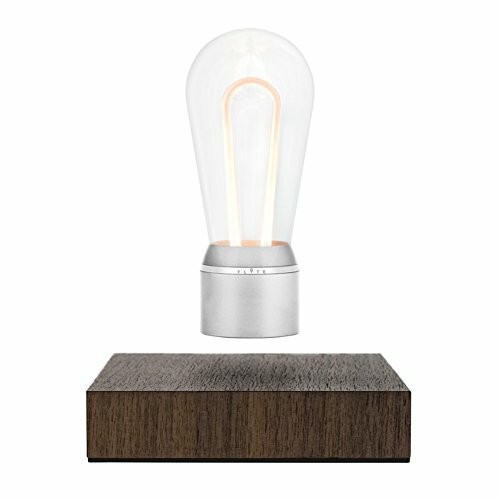 Both products are fitted with long lasting light bulbs that use minimal energy. Compared that with the energy-sucking lights we have been used to over the decades. A great feature has given the price of energy these days. Both products are produced by Flyte – a Swedish company whose name is a melding of flight and light we guess. Their products are even more original! We like this product a lot! Long lasting light bulbs that use minimal energy. Both have brilliant designs to brighten your house. 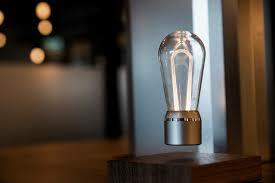 The best levitating light bulb on the market. It is magnetic, so no strings or wires. Max brightness is 60 Lumens and should last up to 50 000 hours! Check out the video below – illuminating.